By the decision of the Synod of Bishops of the Russian Orthodox Church Outside Russia, His Eminence Archbishop Alypy was granted retirement on July 1, 2016 with deep thanks from the Synod for his many years of faithful service leading the Diocese of Chicago & Mid-America. On July 2, 2016, His Grace, Bishop Peter of Cleveland, was commemorated at the Divine Liturgy headed by Metropolitan Hilarion, First Hierarch of the Russian Orthodox Church Outside Russia, as Archbishop of Chicago & Mid-America. On August 17/30, 2016, on the day of the heavenly protector of Archbishop Alypy, Venerable Alypy the Iconographer of the Kiev Caves, a special celebration will be held at the Diocesan Cathedral of the Protection of the Mother of God in Des Plaines, IL. This cathedral was the ruling cathedral of Archbishop Alypy, and His Eminence frescoed the interior of the cathedral, arguably as his crowning achievement as one of the most accomplished iconographers of the Russian emigration. The liturgical celebration on August 30, starting at 9 AM, will be headed by His Eminence, Metropolitan Hilarion of Eastern America & New York, First Hierarch of the Russian Orthodox Church Outside Russia. 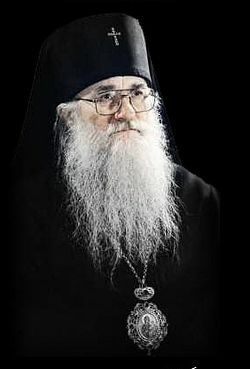 It is expected that His Eminence will be joined by a multitude of Hierarchs and priests, including Archbishop Peter of Chicago & Mid-America. Following the Divine Liturgy on this day a festive meal will be held in the cathedral hall in honor of Archbishop Alypy, his many years of service as a ruling bishop, his academic accomplishments as a professor of Church Slavonic during his years as a Hieromonk at Holy Trinity Monastery in Jordanville, NY, and his many achievements as an iconographer. The public is welcome at both the Divine Liturgy and the meal to follow. We ask the prayers of all for Archbishop Alypy as His Eminence enters his retirement years and is able to focus more intently on his preparation for the next life.